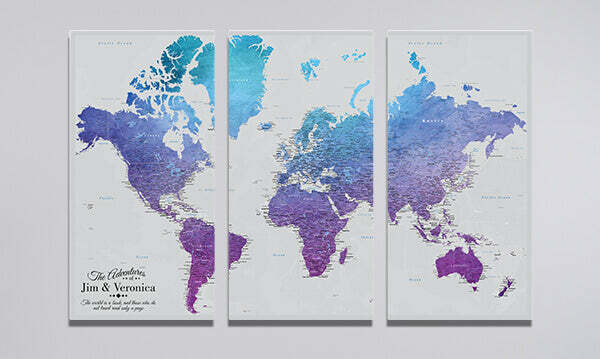 Track and show off past and future travel adventures with our dazzling 3-Panel Vibrant Violet Watercolor World Map! This extra-large 3-panel gallery wrapped pin map has a lovely watercolor design in shades of blues and purples that really pop against the soft grey color for the oceans. The rich textured finish of the canvas and modern 3-panel gallery wrap map design make the vibrant continental colors burst right off the wall. Relive your favorite vacation memories and create the ultimate conversation piece with this interactive artwork for your home, office or business. One of our more detailed map designs, this map has all 50 US states labeled and outlined and country capitals named and highlighted with a star. Antarctica has been removed from this world pin map to create more pinnable space. Inspire wanderlust and future holidays with this large 3-panel world travel pin map that is sure to become the prominent centerpiece of your décor. The bigger size gives you more space to pin and larger font sizes. You can even personalize your map with a name, favorite quote and pin legend to really make it your own. Makes a unique and thoughtful gift idea for that loved one who has a Bucket List of travel destinations a mile long!